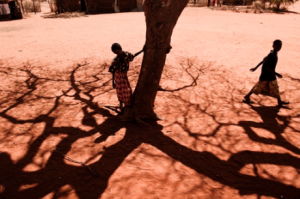 Headlines tell us that a severe drought in the Horn of Africa is responsible for creating “the most severe food security emergency in the world today.” But is it? Images of emaciated children and desperate parents have flooded the news. More than 10 million people in Somalia, Kenya and Ethiopia are in need of assistance. Levels of malnutrition are rising rapidly. Some 1,600 Somalis are arriving daily at refugee camps in southeast Ethiopia, and thousands of Somalis are trekking by foot to the already over-crowded Dadaab refugee camp in northern Kenya. The crisis has invoked the specter of Ethiopia’s famine, a calamity that took the lives of nearly one million people in the mid-1980s. Scientists are debating whether this drought is a direct result of climate change or a natural progression of changes in the environment. Regardless of the causes, the effects—widespread hunger and food insecurity—are anything but natural. So what really underlies the current crisis in the Horn of Africa? Two seasons of failed rain, leading to crop losses and the deaths of livestock, have certainly had an immediate impact on the lives of farmers and herders. But other, more structural factors have transformed this drought into a disaster. Conflict and failed government policies have pushed already impoverished, rural and marginalized communities to the brink. In Somalia, decades of war and instability have destroyed infrastructure, driven millions from their homes and devastated livelihoods. In Kenya and Ethiopia, a lack of effective social protection programs means that the poorest are the most vulnerable to crises. Recent and dramatic increases in food prices make it even more difficult for vulnerable people to cope without government intervention, especially since poor families already spend as much as 70 percent of their income on food. Some communities, such as the Turkana and the Isiolo in northern Kenya, have been historically neglected; a long-standing lack of investment in infrastructure and services in this drought-prone area means that these communities have few sources of support when disaster strikes. Effective government policies can reduce communities’ vulnerability to disaster and even enhance their resilience. Rights-based and sound land management policies can combat desertification and support pastoralist communities who need access to grazing land for their livestock. Investments in agriculture, especially for small farmers, are critical for promoting the food security of communities. Sustainable agricultural practices—like using organic inputs, planting a variety of crops and saving seeds—increase the availability of local food, foster good nutrition and promote the health of the environment. The question is whether there is a political will to prioritize such efforts. There is no single solution to the dire situation in the Horn of Africa. But it’s possible to prevent the kind of crisis we are witnessing now. American Jewish World Service (AJWS), an international development and human rights organization, is promoting sustainable solutions to these problems by supporting marginalized communities in Kenya and Ethiopia to protect their natural resource rights and strengthen their livelihoods. We are also responding to this immediate crisis by partnering with organizations to distribute aid to those who are most in need. Please click here to contribute to drought relief, and check back here for updates as the situation unfolds. Gitta Zomorodi is Program Associate for Africa at American Jewish World Service.